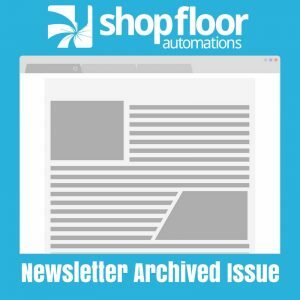 The following is an archived copy of the Shop Floor Automations Newsletter from May/June 2013. Where do you stand with your competition? Are you behind on the “automation” curve? Shop Floor Automations has the solutions and expertise to put your company ahead of your competition. Over the years you have invested in infrastructure, tooling, machinery and people but what about the technology and software? Are you being pro-active on maintenance of your machines? Does your documentation reflect the latest version of the part being produced? Are you still using a white board or Excel to schedule jobs? How are you tracking downtime? Are you still using floppy disks, PCMCIA or USB sticks to manage your programs? Are you currently using serial hubs and RS232 cabling to your machine tools? Is your DNC System outdated, problematic and/or no longer supported? We offer two very competitive products to meet your requirements which are completely supported by the industry standards and are forward compatible in Windows 2008R2 Server and Windows 7 32/64 bit systems. Now you can swap out your communication system with a new wireless solution. More CNC machines are now network based and require connection to your company LAN. Why not add our latest wireless CNC adapter to your new machine instead of running an Ethernet or serial cables across the shop floor? If you still have serial ports on your controls, simply connect to the RS232 port on the device. Swap your cabled system for wireless! Upgrade your DNC System by calling us and receive up to 25% off the list price for competitive upgrades. You are constantly getting updates from your family and friends via email, texting, Skype, Facebook, LinkedIn and Twitter – but what about updates about your shop floor? How often have we learned we missed the due date on the job because the machine was down for maintenance, the first article sign-off was delayed and the machine was in “setup”, or the operator indicated there was problems with tooling or the part program. The answer is Machine Monitoring and Data Collection starting at $45 per CNC each month. Stay connected to the shop floor by viewing real time data across the web, on your cell phone or on your tablet. Shop Floor Automations is celebrating our 15th year in business providing the best in software, hardware and integration services. Let us analyze your shop and provide you with the best solutions to suit your needs!